Let's face it, nobody likes to be charged for shipping. For some reason it's the one thing that really bugs all of us. We like to shop and we like the wonderful convenience of having things dropped off at our door, but we really don't like having to pay for it no matter how low the cost. It's just one of those quirks we all share. 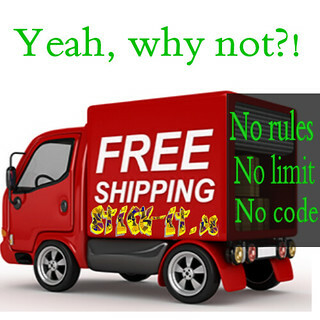 We decided to give “FREE Shipping” a try and it turns out you like it so we're gonna keep it. All of our sticks ship to you Free of Charge. That's right, you can order as many as you want and in any combination. Everything on the Stick-It.us website ships to you FREE in the United States.